The 37th Luoyang peony festival will be held at Luoyang, Henan province from April 5 to May 5. best time for enjoying peonies is April 13th to April 25th. During the festival, the whole city becomes a sea of blossom and the air is scented with peony. Luoyang Dahua invites you to Luoyang to enjoy the Peony, the beautiful scenery, and the high quality crusher machine. 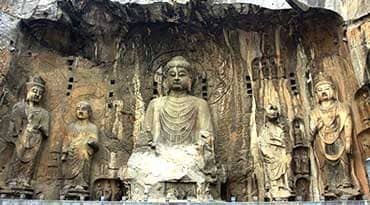 Longmen Grottoes: The Longmen Grottoes are located in the south of Luoyang City. They are between Mount Xiang and Mount Longmen and face Yi River. The grottoes were started around the year 493 when Emperor Xiaowen of the Northern Wei Dynasty (386-534) moved the capital to Luoyang and were continuously built during the 400 years until the Northern Song Dynasty (960-1127). The scenery measures 1,000 metres (about 1,094 yards) from north to south where there are over 2,300 holes and niches, 2,800 steles, 40 dagobas, 1,300 caves and 100,000 statues. Most of them are the works of the Northern Wei Dynasty and the flourishing age of the Tang Dynasty (618-907). Lots of historical materials concerning art, music, religion, calligraphy, medicine, costume and architecture are kept in Longmen Grottoes. White Horse Temple: White Horse Temple or Bai Ma Temple is reputed as the first Buddhist temple in China and considered to be the place where Chinese Buddhism originated. Established in AD 68 of Eastern Han dynasty, with over 1900 years history. Today's White Horse Temple is a rectangle courtyard facing south. 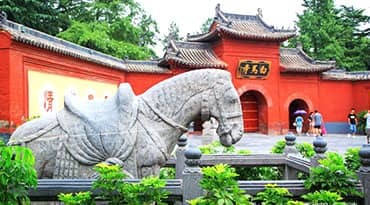 The gate of the White Horse Temple was built in Ming Dynasty (1368 - 1644)and it is three arches side by side.Covering a total area of 40, 000 square meters, the temple mainly consists of Tianwang Hall, Great Buddha Hall,Daxiong Hall, Jieyin Hall,Qingliang Terrace and Pilu Pavilion, which are all distributing along the north-south central axis. 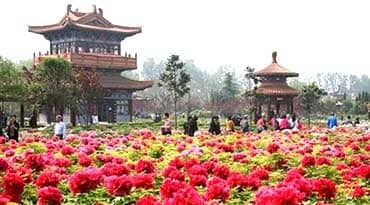 Luoyang National Peony Garden: It is one of the oldest gardens to grow and reproduce peonies in China. It is divided into North Garden and South Garden. There are over 1 million peony trees of 1,200 different kinds. The peony blooming here is highly reputed for its big flower, flamboyant color, numerous species and lasting florescence. Blooming date: more than 100 kinds of peonies will first bloom from April 5th to 10th; 500 or so kinds of rare peonies will be in full bloom from April 11th to 20th; other 200 species usually flower late from April 21st to May 4th. The garden is especially famous for the 1600-year-old and 3-meter-high “peony king”. Baiyun Mountain Forest Park: Baiyun Mountain Forest Park is a natural virgin forest located at the place 88 km away from the southwest of Luoyang City. It covers an area of 168 square kilometers. It's been investigated that there are 204 species of animals and 1,991 species of plants, and the forest coverage rate is over 95%. Therefore, it is honored as the "Natural Museum" by specialists. The Mt. Baiyunshan is enveloped deep in the fog and amidst clouds, its peaks present or disappear among white clouds in a changeable way, hence, it got the name of "Fairyland in mortal world". 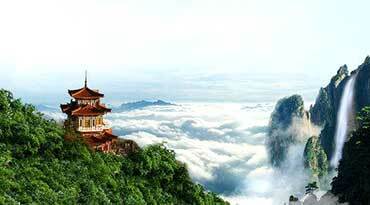 With its peaks towering magnificently, there are 37 peaks with a height of over 1500 meters above sea level there. Yuhuang Summit, the lofty and majestic peak with a height of 2211.6 meters above sea level, it is the highest peak in Central Plain. Luoyang Water Banquet: As the most peculiar dish in Luoyang, the Water Feast is famed as 'Top Banquet under the Heaven'. It originates from the Tang Dynasty (618-907) and has a long history of over one thousand years. 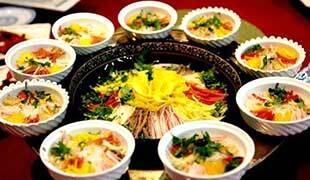 Luoyang Water banquet is a traditional food which has a long history. The so-called "water feast", has two meanings. One is that it is mainly soup, second meaning is that when you eat one dish there will serve a dish subsequently, one dish after one dish just like running water. The flavor of Water feast is mainly hot and sour taste, composed of 24 dishes, therefore called as "three eight feast" for short. Luoyang Water Banquet features are meat with vegetable, it uses material widely, the feast can be complicated or simple, and the taste can be various. Paste Noodle: It is not only the most common local food in Luoyang, but also one of the well-reputed snacks around China. The most distinct feature of paste noodle is easy digestion. 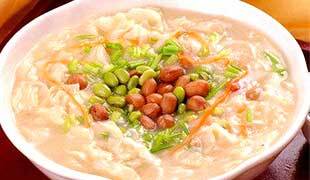 First, heat up the black soybean milk or mungbean milk, and then add sesame oil to it. When it is boiling, put noodle in it and stir it unceasingly before seasonings including salt, chopped green onion, petits pois, celery, Chinese chives and pepper are dropped into it. There exists a special way to enjoy the noodle, that is, the longer it keeps on alternate day, the better it tastes. 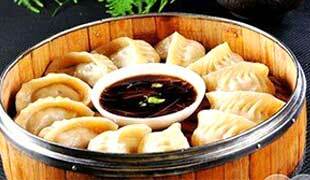 Steamed Dumplings (Tangmian Jiao): Steamed dumpling is a famous traditional snack. It was created in the third year of the republic of China (1914) and has a history of more than 80 years. The dumplings are made in the shape of a crescent moon, famous for their thin wrappings and jade-like color. The whole taste is fresh and delicious. This project is an EPC project, with the production capacity of 600 t/h. The processed material is limestone. Form preliminary site investigation, design, project solution optimization, machine installation, commissioning and delivery to customers are all designed and manufactured by our company. Equipments: ZSW1860 vibrating feeder, JC140 jaw crusher, DHKS6016 jaw crusher, vibrating screen and electrical control system. This production line of Chongqing Haokou hydropower station is used for limestone processing, the production capacity is 650 t/h. The finished products are 0-5mm，5-20mm，20-40mm，40-80mm，80-120mm. The system has reasonable technological design and high production efficiency, and can produce a variety of finished aggregate and sand required by construction at the same time. Equipments: jaw crusher, strong impact crusher, PLS sand making machine, heavy duty vibrating screen, liner screen, and dehydration screen.